The Productivity Commission of the Australian Government issued its Draft Report on Intellectual Property Arrangements. Responses are invited by June 3, 2016. A second consultation is on Data Availability and Use for which an issues paper was released on 18 April to assist anyone wanting to prepare a submission to the public inquiry. It outlines a range of issues about which the Commission is seeking information. Initial submissions are due by Friday 29 July 2016. Further comment will be sought upon release of the draft report in November 2016. An International Alliance of Research Library Associations, including CAUL, endorsed an Accord on Open Data. Richard White, the University of Otago’s copyright officer, took a look at the recent revelations about Sci-Hub usage (see more below). Jane McCredie at the Medical Journal of Australia wrote on OA in this blog: Open access, the modern dilemma. In speech to the AACR US Vice-President Joe Biden came out strongly in support of OA, data sharing and collaboration as part of the $1 billion Cancer Moonshot initiative. SPARC reported on this here. How do researchers access scholarly publications? There was even more discussion about Sci-Hub following an article in Science (Who’s downloading pirated papers? Everyone). along with a feature on its founder and a responsefrom the Editor-in-Chief of Science. To continue the theme of the ways in which academics access research, a paper which surveyed how students access the resources they need found only one in five obtain all resources legally. Ryan Merkely, CEO of Creative Commons, wrote in Forbes: You Pay to Read Research You Fund. That’s Ludicrous. And in the courts, a judgement (Court Correctly Interprets Creative Commons Licenses) on Creative Commons was hailed as an important interpretation of the issues. RightsStatements.org – an initiative of Europeana and the Digital Public Library of America – announced the provision of 11 standardized rights statements for online cultural heritage. Full open access for all scientific publications. A fundamentally new approach towards optimal reuse of research data. Alignment of policies and exchange of best practices. There were then twelve concrete actions proposed as a result of these goals. Danny Kingsley reported on the first OSI workshop in this blog Watch this space. JISC in the UK outlined released its OA Publisher Compliance document. A paper defending hybrid journals by the Publishers Association triggered a strong response from RLUK. The DOAJ announced it had removed more than 3000 journals from its database for failing reapply by the deadline. This is part of a long-term project to curate the DOAJ list of journals. Two new manuscript submissions systems for open access publishing were launched. From eLife there was Continuum, a new open-source tool for publishing and from the PLOS journals, Aperta was launched on PLOS Biology. In other journal news, Canadian Science Publishing announced the launch of FACETS, Canada’s first and only multidisciplinary open access science journal. An analysis of two publishers, Springer Open and de Gruyter, have shown that they are developing a model whereby institutions sponsor a journal, that then has no article processing charge for authors. In news from CERN, the SCOAP3 initiative was extended for three more years and CERN put 300TB of data from the Large Hadron Collider online. Preprints and their place in scholarly communication are a hot topic for discussion. Hilda Bastian dissected some of the issues in her blog, Breaking Down Pros and Cons of Preprints in Biomedicine – where she also draws the cartoons. But in further new of their increasing acceptability, Crossrefannounced that members will soon be able to assign Crossref DOIs to preprints. Heather Morrison continues her excellent regular summary, Dramatic Growth of Open Access with a March 31, 2016 update. More controversially, she noted that Elsevier is now the worlds largest publisher of OA journals (by number of journals) which is prompted discussion on twitter about what that really means for OA . The HathiTrust Research Center announced that it had expanded its services to support computational researchon the entire collection of one of the world’s largest digital libraries, held by HathiTrust. In Phase I of the Open Science Prize, an initiative from the Wellcome Trust, US National Institutes of Health and Howard Hughes Medical Institute, six winning teams received prizes of $80,000 to develop their prototypes. Winners included MyGene2: Accelerating Gene Discovery with Radically Open Data Sharing, a collaboration between researchers at the University of Washington, United States, and the Garvan Institute of Medical Research, Sydney. We can’t cover everything here! For daily email updates the best ways to keep up to date is the Open Access Tracking Project. Our Twitter account has posts throughout each day and our curated newsfeed on the website is updated daily. The newsletter archive provides snapshots of key issues throughout the year. 11th Annual Conference on Open Repositories takes place at Trinity College Dublin (TCD) from the 13th – 16th June 2016. The theme for this years’ aaDHDigital Humanities Australasia Conference in Hobart, 20-23 June is “Working with Complexity“. OASPA’s 8th Conference on OA Scholarly Publishing (COASP) will be on 21st & 22nd September, 2016. at Westin Arlington Gateway, Virginia. SPARC has announced that the theme for this year’s 9th International Open Access Week, to be held October 24-30, will be “Open in Action.” Details below. International Open Access Week has always been about action, and this year’s theme encourages all stakeholders to take concrete steps to make their own work more openly available and encourage others to do the same. From posting pre-prints in a repository to supporting colleagues in making their work more accessible, this year’s Open Access Week will focus on moving from discussion to action in opening up our system for communicating research. Established by SPARC and partners in the student community in 2008, International Open Access Week is an opportunity to take action in making openness the default for research—to raise the visibility of scholarship, accelerate research, and turn breakthroughs into better lives. This year’s Open Access Week will be held from October 24ththrough the 30th; however, those celebrating the week are encouraged to schedule local events whenever is most suitable during the year. The “Open in Action” theme will also highlight the researchers, librarians, students, and others who have made a commitment to working in the open and how that decision has benefitted them—from researchers just starting their careers to those at the top of their field. The Open Access Directory listing of social medial sites about OA has been updated and revised. You can help improve it by suggesting edits. This blog is a short update of events and developments in open access to mid-March 2014. It includes: International open access news, Reports & Research, Australian open access news, Wraps of 2013, New open access policies – international, Events, AOASG news and feedback from AOASG followers. Last year OA copped a bad name because of the ‘sting’ by Bohannon where some of the (only OA journals) that were sent a scientifically unviable article accepted it for publication. At least that article was in English. On 25 February Nature reported: “The publishers Springer and IEEE are removing more than 120 papers from their subscription services after a French researcher discovered that the works were computer-generated nonsense.” These gibberish articles were supposed to be ‘peer reviewed’ and were available under subscription, published mainly in conference proceedings. Academic publishers have launched their scheme to allow free access to research journals at UK public libraries. 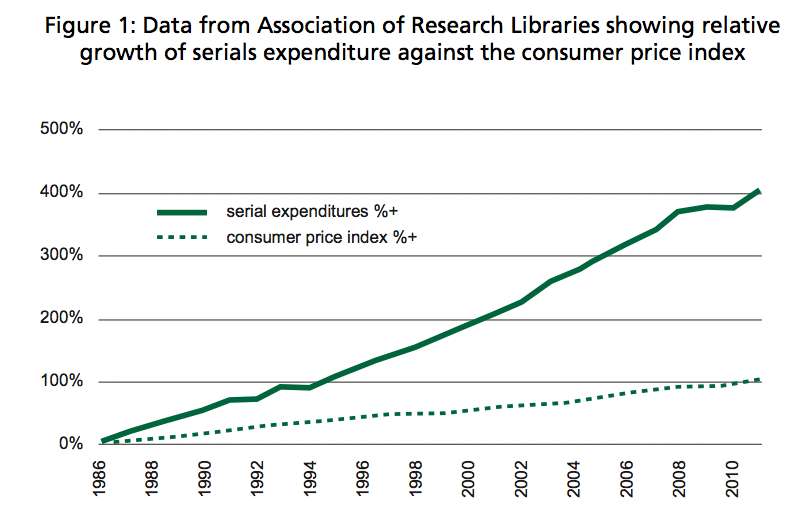 This was one of the concessions the publishing industry made in the Finch Report. Users have to walk into the library to have this access. The project will initially run as a two-year pilot while interest is monitored. T&F supplemental material is now available in a new online format as tables, datasets, filesets, videos and graphs become instantly viewable on Taylor & Francis Online, easily discoverable from search engines and quickly hosted on Figshare. The pilot began in 2011 and as part of the pilot, a survey was conducted by Routledge to canvas opinions on the Library & Information Science Author Rights initiative and also investigated author and researcher behaviour and views on author rights policies, embargos and posting work to repositories. The survey elicited over 500 responses, including: “Having the option to upload their work to a repository directly after publication is very important to these authors: more than 2/3 of respondents rated the ability to upload their work to repositories at 8, 9, or 10 out of 10, with the vast majority saying they feel strongly that authors should have this right”. Elsevier sent a series of take down notices to Academia.edu and individual universities requesting take down of the Published Version of their works on these websites. Understandably this caused a great deal of discussion. Click here to see an example post. The report “Developing an Effective Market for Open Access Article Processing Charges” was commissioned by several major UK and European funding bodies and examines the current status of the APC market, concluding that hybrid is twice as costly as fully open access and describing three possible scenarios suggesting ways to improve the market into the future. The Guidelines to compare Institutional Repository Software is being published as part of the UNESCO’s Open Access Strategy. It compares the features of the major platforms and is intended to help libraries focus on which features will help facilitate the success of their repository. NOTE: The authors were from bepress which fares very well in the comparisons. The study was by an independent research Dr Phil Davis who analysed the half-life of 2812 journals. Half-life refers to the amount of time it takes for articles in a journal to receive half of their lifetime total downloads. Some findings are not surprising – that these vary widely, and the timeframes are quite long (certainly in particular fields). What is perhaps surprising is that “Only 3% of journals in all fields have half-lives of 12 months or less”. A news story about the study is here. The report from the research group, CIBER, by David Nicholas, et al surveyed 150 library directors and has come to the conclusion that there is still considerable development required in the growth of institutional repositories. It found that 70% had a digital repository, and 23% were planning one. It found that institutional repositories are mostly small affairs, operating on small budgets with one or two full time staff, and usually costing only about 1.8% of the total library budget. Their main objectives, according to the article conclusions, are to provide a shop front for the institutional output, with increasing global access to research a close second objective. The University of Wollongong has released its open access policy which applies to all research outputs including those that are non-peer reviewed. The policy is here. The Copyright and the Digital Economy (ALRC Report 122) was tabled 13 February. One news story about it: “Brandis likely to knock back relaxed copyright rules”. This article from The Conversation is a good wrap of what has happened in Science & Medicine in 2013, including an honourable mention for Matthew Todd at the end. 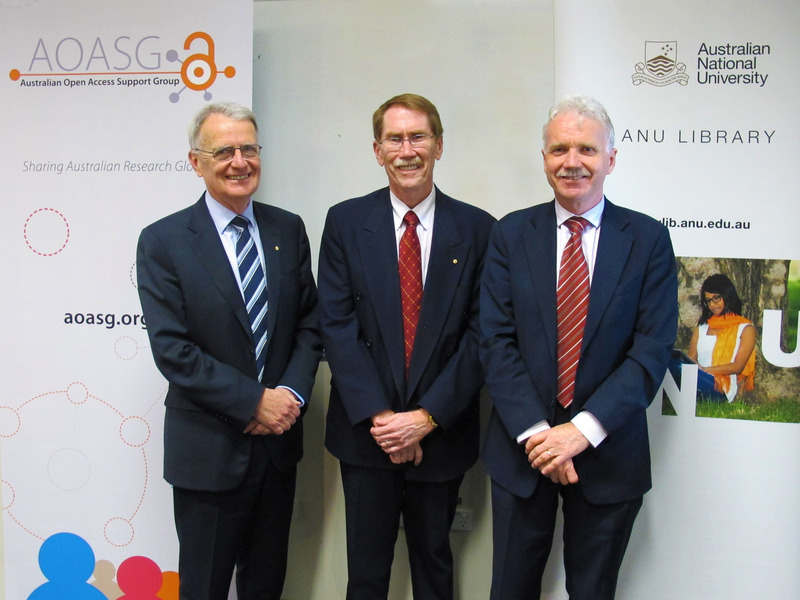 2013 marked the first year of activity for the AOASG. This blog summarises the activities and achievements of the group throughout the year. The workshop is free to attend and will run from 9.30-12.30 (registration open from 9.00). As places are limited, if you register, and then find you can’t attend, please email karen.visser@ands.org.au so we can open up your place to someone on the waitlist. To book click here. The AOASG held a Strategic Planning Day in January, finalising the Constitution, determining Strategic Priorities for 2014 and reworking the Terms of Reference. Click for the full document. The AOASG is currently publishing a series on ‘Paying for Publication’ which aims to demystify some of the aspects of payment for publication, beginning with publication costs and a description of the hybrid model. Pages released to date include the cost of hybrid, addressing double dipping, asking if OA funds support hybrid and noting not all hybrid is equal. Additional pages include ‘0pen access policies’ and Resources ‘about open access’. The Twitter account @openaccess_oz celebrated its 500th follower on Twitter just before Christmas and by March this had grown to 565 followers. Just wanted to send my appreciation for this series. Your OA Support group blog is always a go-to resource as I figure out this work at Florida State. Thanks! Micah V.